Pure Water Gazette » Desalination: Will It Solve Our Water Shortage? CARLSBAD — On sunny afternoons, this stretch of beach 35 miles north of San Diego offers a classic So uthern California backdrop: joggers, palm trees and surfers, flanked by waves rolling in and pelicans soaring overhead. But just across the road, another scene, unlike any other in the state’s history, is playing out: More than 300 construction workers are digging trenches and assembling a vast network of pipes, tanks and high-tech equipment as three massive yellow cranes labor nearby. 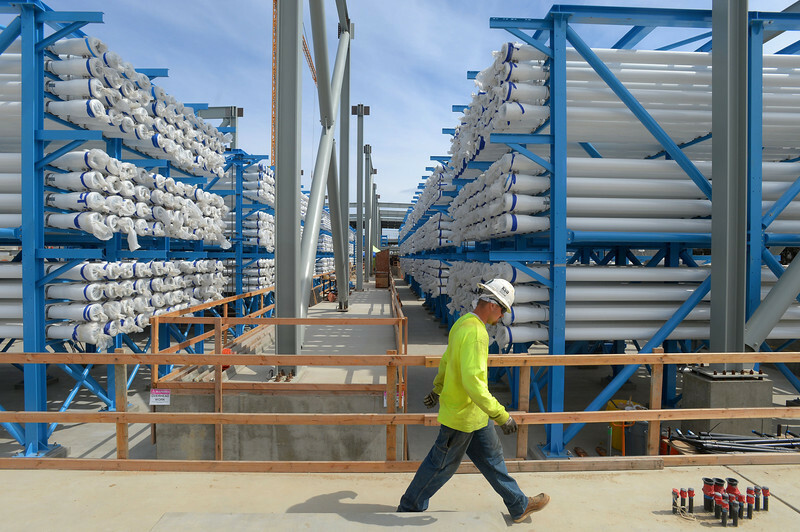 The crews are building what boosters say represents California’s best hope for a drought-proof water supply: the largest ocean desalination plant in the Western Hemisphere. The $1 billion project will provide 50 million gallons of drinking water a day for San Diego County when it opens in 2016. Since the 1970s, California has dipped its toe into ocean desalination –talking, planning, debating. But for a variety of reasons — mainly cost and environmental concerns– the state has never taken the plunge. Will California — like Israel, Saudi Arabia and other arid coastal regions of the world — finally turn to the ocean to quench its thirst? Or will the project finally prove that drinking Pacific seawater is too pricey, too environmentally harmful and too impractical for the Golden State? “Everybody is watching Carlsbad to see what’s going to happen,” said Peter MacLaggan, vice president of Poseidon Water, the Boston firm building the plant. For the plant to be a success and copied in other parts of the state, Poseidon will have to deliver high-quality drinking water at the price promised — and not cause unexpected impacts to the environment such as fish die-offs. Desalinated water typically costs about $2,000 an acre foot — roughly the amount of water a family of five uses in a year. The cost is about double that of water obtained from building a new reservoir or recycling wastewater, according to a 2013 study from the state Department of Water Resources. And its price tag is at least four times the cost of obtaining “new water” from conservation methods — such as paying farmers to install drip irrigation, or providing rebates for homeowners to rip out lawns or buy water-efficient toilets. In Carlsbad, two gallons of seawater will be needed to produce each gallon of drinking water. And to remove the salt, the plant will use an enormous amount of energy — about 38 megawatts, enough to power 28,500 homes — to force 100 million gallons of seawater a day through a series of filters. The process, known as reverse osmosis, removes salt and other impurities by blasting the water at six times the pressure of a fire hose through membranes with microscopic holes. “You can’t conserve or recycle what you don’t have,” Yamada said. Nobody disputes that the cost of water will go up. According to Yamada, the average customer’s bill, now $71 a month, will rise $5 to $7 to pay for desalination. Earlier this month, the Santa Barbara City Council voted to spend $935,000 to hire an engineering firm, law firm and lobbyist to try to restart the city’s shuttered plant by 2016. Similarly, the California American Water Company in Monterey County is studying three locations to build a desal plant to make up for water lost when state regulators ruled the company didn’t have valid permits for the Carmel River. In Los Angeles, leaders of the West Basin Municipal Water District, which serves about 100,000 people, built a pilot plant in Redondo Beach and are studying plans for a $300 million desalination plant by 2020. Santa Cruz city officials in August shelved plans for a desal plant after environmental activists raised fears that the new water might trigger more growth. Marin County studied a desal project, then dropped it when water use declined. Long-running plans to build a desal plant in San Francisco Bay near Concord were shelved this year when the region’s largest water districts decided they could obtain water more cheaply through recycling and other means. Plans by Poseidon to build a desalination plant in Huntington Beach slowed last year when the Coastal Commission said it wanted the company to investigate whether its pipes could be buried, a prospect that will increase costs. For the Carlsbad plant Poseidon was required to build 66 acres of wetlands in San Diego Bay to offset the plant’s environmental harm. It also must blend its brine at a 5:1 ratio with other seawater before flushing it back into the ocean so it won’t harm marine life. Other projects will have to do all those things to get state permits. Source: San Jose Mercury News.